Recently, Scott Weiner, a California state senator from San Francisco, proposed several truly radical housing bills. One would remove local land-use controls and establish density minimums around transit, one would create more worker-specific housing, and another would reshape how local data gets used to determine housing allocations. All three would basically do the opposite of what California has done over the last half century and represents a truly exciting reboot for housing policy with implications beyond the state. Of course, radical change brings lots of resistance, especially from homeowners. Without being familiar with California politics, I can’t speak to the chances of these bills passing, but in a very important way, it doesn’t matter. At this stage in the affordable housing crisis, the fact that such a radical bill has entered the discussion in California should have tenants everywhere excited. That’s because the most important part about these bill proposals is how radical they are. Housing advocates need to reject the housing policy status quo. Namely, we must evolve away from deferring to the market worship that frames every discussion (which needlessly creates economic and political winners and losers that harm the public interest) and instead embrace larger principles like housing as a right, which creates a shared vision that strengthens the public interest. The first bill, SB-827, would supersede any local development restrictions about height and density close to public transportation centers. I’ll talk about the transit next, but the most important aspect of this bill is creating the precedent to override the power of local homeowners to block development in their cities or towns in the interest of creating more affordable housing. I’ve written a ton about how policies favoring homeownership have been adisaster for the US. They were demonstrably based on racism; they created shocking economic and social inequalities; and they have caused lasting environmental damage that has also paralyzed our built environment. All of these problems have manifested into the repressive, anti-democratic power that homeowners have to prevent development near them, which hurts all non-homeowners (and some less connected homeowners). Nowhere has this been worse than in California, where low-density single-family housing still dominates most of the state, especially in economically productive places like Silicon Valley. Because we treat housing more like an asset than a consumable good, homeowners are incentivized to protect/promote the value of their property. This almost always means restricting what gets built around them out of fear that it would lower property values. And this almost always means passing highly-restrictive land-use policies that go far beyond their original intent of protecting people from pollution, noise, or other nuisances. These policies typically favor ownership over renting, low-density over high-density, and restricted development rights over as-of-right development. Often they are presented as benign intentions towards preserving the character of the neighborhood, controlling traffic and road safety, or maintaining neighborhood control. But, at its core, they are about protecting or enhancing the wealth of a few incumbent property owners. The end result is homeowners, through pliable or aligned local governments, are allowed to veto development (public or private) and to block other people from living in their communities. Especially in places like Silicon Valley, thiskills the economic and social mobility that has defined American opportunity in previous generations. SB-829 will be the biggest political fight of the three bills because it attacks the largely-accepted concept that homeowners have the divine right to dictate development in their towns or cities. But overcoming this misguided and abused view is the first dragon that must be slain to change the housing debate in the US. In addition to overriding local land-use control, SB-827 creates a proper incentive (indeed, a mandate) to build close to public transportation. Under the proposal, developers can build tall buildings, denser streetscapes, and fewer parking options as-of-right within 1/2 mile of transit stations or 1/3 mile of frequent bus routes. In fact, the proposal has mandatory minimums for heights and density in these zones. This has an obvious virtuous cycle. Public transportation is designed to support high-density populations. The more you can build around it, the more people will use it, and the more an area will prosper (see NYC). This creates a more diverse housing stock which allows a more diverse group of people and businesses to cluster in more parts of the state. It’s estimated that the proposal could create an additional 3 million units in these zones across the state. That would almost single-handedly solve the affordable housing crisis in California. 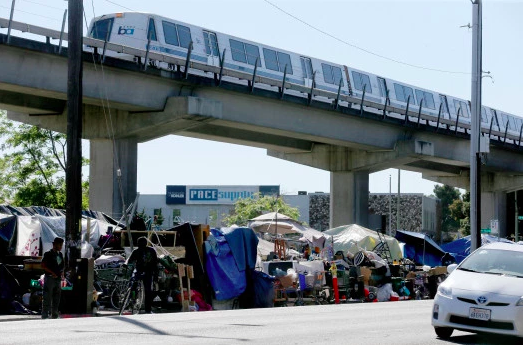 As much as California is portrayed as a car-crazy, traffic-inundated dystopia, this bill rightfully recognizes that many major urban centers already have extensive transit systems or at least the foundation for them. However, ridership on the Metro, BART, and Caltrain, are all declining. This is because the lack of density near lines and stations severely limits these systems’ viability for many residents. If you have to drive to a transit station, you might as well just keep driving to your destination. With this bill, more people could live closer to these already-functioning stations. Increased ridership and development would create more incentive to invest in and expand these systems across the state. The environmental and social benefits of reduced car dependency would have its own virtuous cycle. The importance of thinking about housing policy and transportation policy together is the larger principle articulated in this bill and it should be central to all housing advocates’ arguments. Whether you are making a moral argument or an economic argument for housing, transportation should be central to it. SB-827 is getting a lot of attention, but the other two bills both have far reaching implications for building more housing for more types of tenants. SB-829 allows farmers to use parts of their land to develop worker housing as-a-right. SB-828, changes the standards for how each city/town collects data required for affordable housing allotment. In both cases, this shows that a comprehensive housing vision can help all constituencies, especially under-represented tenants. Agriculture makes up a huge part of the California economy. (It shouldn’t, but this isn’t the time/place for that argument, see Cadillac Desert). This requires a considerable amount of low-income, seasonal labor that falls on immigrant (and in some cases, illegal) working populations that deserve, safe, affordable housing too. Many rural communities resist worker-housing for the same NIBMYist reasons (and in some cases, racist reasons) that bigger cities resist density. Senator Weiner is showing a crucial, broad commitment to higher principles of affordable housing that aims to reach all tenants. SB-828 goes a step even further by changing how housing goals are determined for each city and town through the Regional Housing Needs Assessment (RHNA). Currently, this system is easily gamed by many wealthier towns that get lower allotments while poorer, less connected cities or towns get a higher allotment. This allows some towns to escape development, while raising displacement pressure on others. The bill would create a streamlined, consistent data collection and analysis process that would create more equity in development across the state. Development can’t just happen near transit centers and can’t just happen near easily-displaced populations. It must be spread across all communities, especially in wealthier ones. I hope that these bills get serious consideration in Sacramento. There are many reasons to support them and many allies in the state to help do so. Even if they fall short right now (which is no sure thing) they have begun the bigger process of reframing the housing debate in the state that might be suffering the worst from the affordable housing crisis. The rest of us should take noticeand start forming similar plans in our own backyards.